Working smarter with limited resources is a critical business driver for improved ROI. Wringing the most information out of high-resolution imagery datasets is paramount when evaluating reservoir potential or estimating production capacity. All geoscientists, core analysts, and petrophysicists face the challenge of delivering confident recommendations to asset teams while constrained by time and limited expertise. PerGeos was developed specifically for the oil and gas industry to enable E&P engineers to better understand the quality and performance of hydrocarbon reservoirs. Thermo Fisher Scientific built PerGeos on the Avizo foundation, enabling it to streamline and simplify analysis and modeling of data sets, which improves consistency and confidence in results. 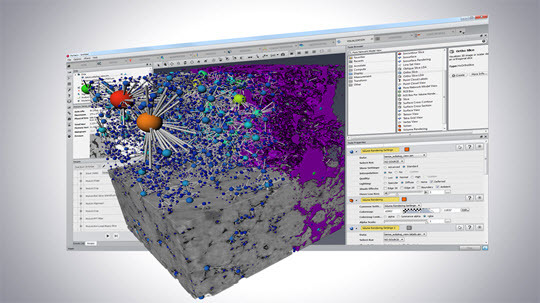 Core analysts, geologists, and petrophysicists can integrate data from multiple sources and share descriptions and statics using a common platform. Watch the video to learn how PerGeos helps E&P operators make better decisions, faster. Learn how our software helps geologists, core analysist, and petrophysicists perform their work faster than waiting for traditional lab results through an intuitive UI making the learning curve less substantial and streamlining data transfer to impact decision-making. View application examples processed through the largest toolkit of image filtering, processing, and segmentation workflows currently available for digital rock data sets. Would you like to request a quote or schedule a demo?